Food and safety in the kitchen are more of an issue that you might expect. Many hand surgery professionals would consider the kitchen to be the most dangerous room in the home. (Perhaps this doesn’t include a garage or workshop that contains table and power saws.) People don’t realize that a seemingly simple task or chore in the kitchen can result in a devastating injury that may leave someone with a permanent disability. This surprising threat was highlighted in the New York Times “Personal Health” section on Tuesday, August 20th. An unfortunate case of avocado pitting gone wrong was highlighted in this article. The patient sustained multiple tendon, nerve, and artery lacerations in the fingers when the knife slipped off the avocado and into the palm. Just like that… life changes forever. It is important not to rush or try to do too many things at once in the kitchen. Leave yourself enough time to get everything done. 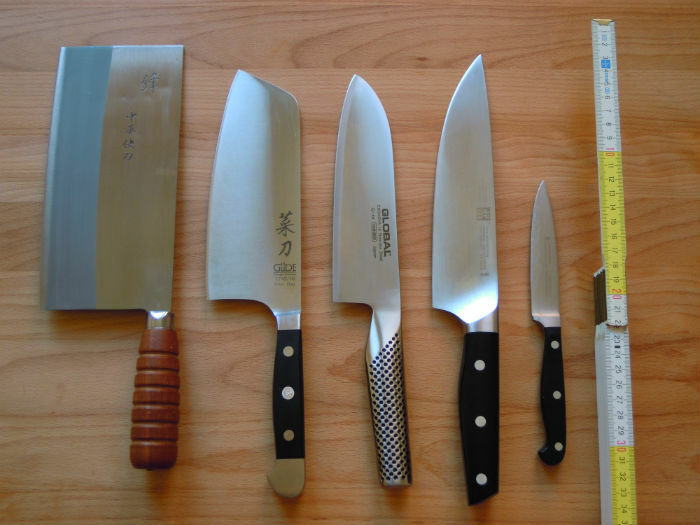 Knives should be sharp, as dull knives are more likely to slip and cut the user. They should be stored separately in their own drawer or case, and never be left out on a counter top or in a sink with other equipment. Care should be taken to keep fingers curled and out of harm’s way. A sturdy cutting surface should be used and the knife should always be used by moving it away from the user’s body. The right knife used for the right job can also improve kitchen safety. For example, a serrated blade is the safest blade for slicing bread. Other sharp objects in the kitchen to watch out for are the edges of cans and their lids, hard plastic packages, and broken glass. Broken glass should be swept up with a broom and a damp paper towel can be used to clean up leftover pieces (instead of using your hands). Burns are another problem in the kitchen. Dry oven mitts should be kept near the stove and microwave, as dish towels make poor substitutes for proper pot holders. Pot handles should be turned away from the edge of the range to reduce the risk of accidental tipping of the pot by the cook or passers-by. Keep heat low under a covered pot of boiling liquid and avoid steam burns by opening lids away from you. Avoid loose sleeves or flowing clothes while cooking and tie up long hair. Open-toed shoes should also be avoided. If you do sustain a burn injury in the kitchen, immediately hold the injured skin under cold water for several minutes. Its also good to keep a fire extinguisher handy and know how to use it. Clean your oven often to keep it free from grease. If fats or oils catch fire, turn off the heat but don’t try to pick up the pan and never pour water on a grease fire… use salt or baking soda… or use your fire extinguisher. Additional advice on fall prevention, poisoning, and child safety are also discussed in this excellent review of food and safety in the kitchen by Jane Body.